Theres no way to guess Quail Lakes was a surface mine. Aside from two deep lakes, theres no evidence that massive earthmoving machines once rumbled across these rolling 1,200 acres of Illinois farmland, lakes, wetlands, and native prairie plants. But the same Quail Lakes that today is home to endangered bird species and hundreds of other wild creatures was a coal mine a surface mine with pits a… s deep as 75 feet. Despite what you have heard about about surface mining, Quail Lakes points to something very different. 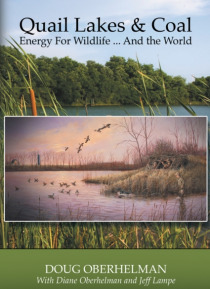 The Quail Lakes you will read about in this book is a microcosm of the realistic and responsible use of land that is possible today. The same property that has yielded crops to feed generations of farmers and livestock also provided coal to generate electricity for homes and businesses. And miners did not leave the land worn out. To the contrary. Thanks to federal mine reclamation laws and passionate stewardship by owners Doug and Diane Oberhelman, the farm fields once again yield bumper crops. Wildlife abounds. And the grasslands and lakes offer wonderful opportunities for fishing, hunting, hiking, camping, swimming, wildlife watching, stargazing, and anything else you can dream of doing in a place where wild animals roam and stars shine bright.